Before looking further into the phenomenon of lay people having their feet washed in the sanctuary, it would be useful to keep in mind the sort of thinking among the progressivists that led up to it. 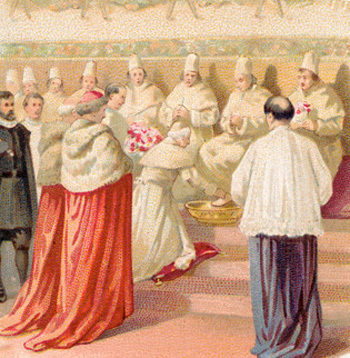 Ever since Beauduin launched his famous dictum at the Malines Conference in 1909 about “active participation” as the right of the laity, his slanderous accusation gained ground through the Liturgical Movement that a dominating clergy had been for centuries unjustly depriving lay people of their rightful role in the liturgy. When Pius XII came to the defense of the so-called lay “victims” by granting them more active roles in the liturgy, he was not only lending support to the reformers’ clerical-lay conflict theory, but also unwittingly creating conflict among the clergy. There were voices raised not only among the clergy, but also the laity against the various reforms of Holy Week. Where all this was leading to was the perfect Marxist-style bellum omnium contra omnes (war of all against all), which would be played out at Vatican II. 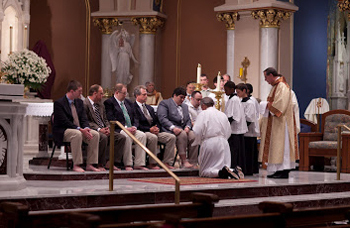 As part of the liturgy of Holy Thursday, the Mandatum was, according to longstanding tradition, a ritual performed among priests, based on Christ’s example of washing the feet of the 12 Apostles at the Last Supper. It is not to be confused with the so-called “Mandatum of the Poor,” (1) an entirely separate ceremony that existed alongside its clerical counterpart. Whereas the latter included laymen, the former was a discreet service performed by clerics and for clerics away from the public gaze. Up to 1955, there was no official approval for either form of ablution to take place in the sanctuary or during the Mass of Holy Thursday. The theological symbolism of the traditional ceremony spoke volumes about its meaning: it was a commemoration of the priesthood on the anniversary of its institution and, thus, intimately related to the Sacrament of Holy Orders. We will need to keep this in mind when we come to consider the inclusion of laymen in 1955 (and later lay women) into the ceremony. The history of the Liturgical Movement has shown how the harmful nature of the reforms is never more sharply exposed than over the issue of lay “active participation” and the consequent steady diminution of the priesthood. The 1955 reform of the Mandatum is a good example of this baneful process, as it illustrates the reformers’ strategy of deconstructing a liturgical ritual and subverting its principles. In this they were aided by the Instruction issued by the Sacred Congregation of Rites, which accompanied Pius XII’s Decree Maxima Redemptionis introducing the Holy Week reforms in 1955. The inclusion of laymen (“viri selecti”) in what had hitherto been an all-clerical ceremony completely changed the way future generations of Catholics thought about Christ’s actions at the Last Supper when He washed the feet of His Apostles. Small wonder that so many have lost sight of the fact that the original Mandatum was not intended for Christ’s followers in general, but only those whom He had personally called to the priesthood. How, then, could laymen be said to represent the Apostles in a ceremony that was meant to commemorate the institution of Holy Orders and the exercise of the priestly ministry? To bestow this privilege upon laymen could only threaten to undermine the identity by which the priesthood is defined. This was an early phase of the reformers’ end-game strategy. With it they turned the ratchet of liturgical confusion another notch. Having first stigmatized all priests as “elitist” who said the Mass in its entirety while the congregation remained silent, they turned the ratchet by promoting vocal participation as a “right” of the laity to say Mass with the priest. They turned it again when they persuaded Pius XII to allow laymen to enter the sanctuary and stand in the place of priests. Thus, a precedent was set in 1955 for the post-Vatican II introduction of “lay ministries” to supplant the traditional role of the priest. Pius XII’s promotion of the foot washing of the laity became the emblem of the liturgical chaos that undermined the role of the priest. It matters not that the ceremony was only optional; its consequences were far reaching. Once the principle had been breached and the essential meaning lost, secularism has made its way into the ranks of the priesthood and even into the sanctuary where priests always exercised their exclusive ministry. That which is supernatural and transcendent was made to yield to the democratic spirit of the modern age and adapt itself to an earthly end. Hence the liturgical free-for-all we see today where literally everyone and anyone can have their feet washed in the name of equality, diversity and inclusiveness. As a result, the Mandatum has now turned into a political platform for immigration and other fashionable shibboleths, making a mockery of liturgical law, spirituality and tradition. Absurd though it may be, this is just the logical conclusion of having reinvented the Mandatum as community service, (4) with the priest as social worker. Thus, we have arrived at a point where the priesthood is no longer honored in this rite as a supernatural benefit to the Church – as it had been honored since the early Middle Ages – but only insofar as it furthers the ideology of “equality” for all. 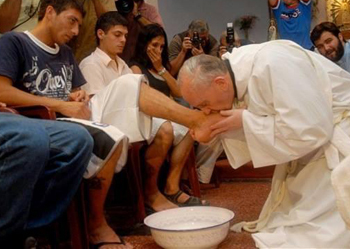 Historical sources dating from the 7th century show that this was a ceremony conducted by religious Superiors who washed the feet of a group of poor men on Maundy Thursday and often accompanied this gesture with a gift of food, clothing and/or money. In medieval times, this ceremony was usually carried out by the Pope in his private apartment, by Bishops in the chapter house and also by Abbots in the refectory of their monastic houses. Maxima Redemptionis, ‘Instructio’, Acta Apostolicae Sedis, 1955, p. 843.